Barbara A.F. Greene serves as an advisor for the THRU Project, a local non-profit dedicated to guide and support foster youth as they age out of the foster care system and venture out on their own. Watch this video about the THRU Project on KABB FOX-29’s show “Focus on South Texas” with Erin Nichols. 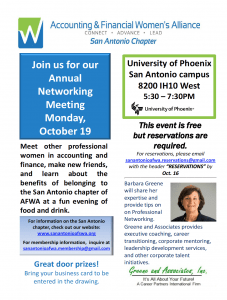 The San Antonio Chapter of the Accounting & Financial Women’s Alliance (AFWA) will be holding their Annual Networking Meeting on Monday, October 19, 2015 at the University of Phoenix-San Antonio campus. Barbara Greene, CEO of Greene And Associates, Inc. will share her expertise and provide tips on on Professional Networking. Download this PDF (or click on the image below) for more information, and reserve your spot at sanantonioafwa@gmail.com.